Freshly squeezed, flavoursome fruit juice is an essential ingredient for every spring event, whether for health-boosting hydration or a thirst-quenching cocktail. With warmer weather finally here, we’ve got the sunny flavours to match and will be showcasing just what our super-machines can do at the 2017 Chelsea Flower Show with official hospitality partners Jardin Blanc – a partnership between RHS, Sodexo and Raymond Blanc OBE, chef patron to the two-Michelin star Belmond Le Manoir aux Quat’Saisons in Oxfordshire. Held in London’s borough of Chelsea since 1912, the prestigious flower show famously boasts some of the world’s most impressive floral displays across its 11-acre grounds. As guests enter through the garden gates they’ll be transported to different horticultural destinations including the likes of Malta, Japan and Bermuda, as the latest, cutting-edge garden designs are showcased to the show’s green-fingered guests. Nestled in a peaceful corner of the show, we’ll be serving visitors the purest and freshest fruit juice available throughout the five-day event, with hospitality partners Jardin Blanc commending the superior efficiency of our machines. 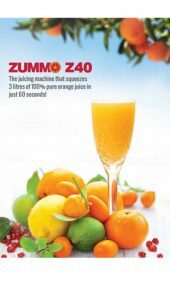 As 157,000 visitors make their way through the floral displays seeking refreshment, our super-fast Zummo Z40 machine will be juicing up to 2,400 oranges every hour! 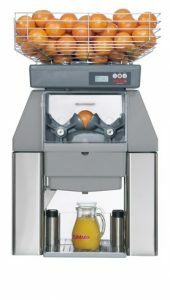 If you’d like to know how Zummo London can add a little zest to your event, or if you manage a restaurant, café, bar or retail outlet and would like know more about the Zummo Z40 commercial juicer and what it can do for your business, please get in touch. We’d love to give you a demonstration of our super-fast juicers – and remember, if you’re based within the M25, the Zummo juicers are free on-loan when we also provide the fruit.